Best noodle soup in the world. To make the broth you need Dashi. You can make it at home with kombu and bonito shavings but we use instant dashi. Dashi, Salt, Mirin (use sparingly), Sake (optional), Soy Sauce (optional). Bring this up to just below boiling temperature. Meanwhile boil your noodles. There are two types, dried and frozen, the latter being a fatter slightly more gelatinous noodle. 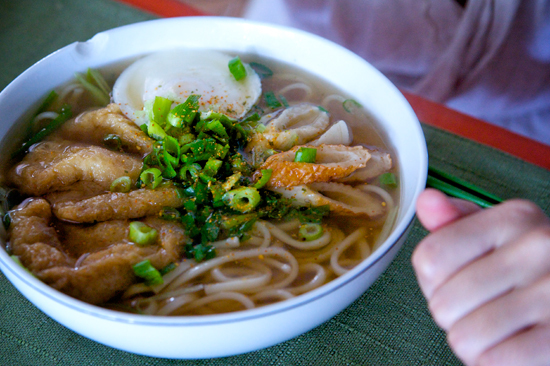 We prefer dry udon noodles, which you can buy at any place that sells dashi. The more expensive the better, it makes a huge difference. Same goes for Fish Cake. We buy bunches at a time and freeze them. Cut them on the bias for better presentation. Abura-age is a type of fried tofu that is amazing in udon. Flash boil the Aburaage to get rid of excess oil (10 seconds or less). Put it in a frying pan with Mirin, Sake and Soy Sauce in whatever proportions you prefer. Cook until the Aburaage soaks up the juice. Slice Green Onion two ways- for the long deep-green stalk, cut 2 inch sticks, pin them down in a large bunch so that they are all parallel and slice thinly so that you end up with small sticks of green onion. When you get to the yellow/white part, chop on the bias. Place the noodles in a bowl, pour broth over it. On top place the boiled fish cake, aburaage, a poached egg (or just crack an egg into the serving dish immediately before the broth, making sure that the broth is just before boiling). Add green onion and shichimi, which means three peppers- shi=three chimi=pepper (I think…) It’s a dry powder of three spicy peppers that you can buy anywhere that you can buy dashi or udon noodles. I love udon. Yours is lovely. looks delightful! like the Japanese version of my favorite pho! Udon soups are really good! Shi means 4. Dunno what chimi means though. Shichi means 7 and mi flavor. Shichimi contains seven different ingredients but mostly consists of ground red chili pepper with a mixture of ground mustard, ground sansho, roasted orange peel, sesame seeds, ground ginger, shiso, nori (seaweed), or aonori (a type of seaweed). There is also ichimi (one flavor) which is just ground red chili pepper.